Make your own high quality personalised calendars with fast delivery. Celebrate the year ahead with a personal calendar that can start any month. These sturdy calendars are filled with your choice of photos on each month and the cover. Our design preview makes designing them easy as you get to see exactly what it will look like. Buy 2 get 1 FREE. Your unique calendar with pictures is handmade to order and customised entirely by you. Design online with our A4 and A3 calendar template to make original calendars and see them a couple of days. Your photos are printed onto beautiful 160gsm silky art paper, which gives exceptional print quality and vibrancy. Choose from A4 or A3 size calendars and upload a different photo - or maybe even a photo montage - for every month. Your calendar is bound with a white metal wire binder, complete with hanging hook, making it quick and easy to display. You can start your calendar from any month you wish, making this the most personalised calendar available. Upload single photos, or have fun creating a montage, using our photo montage tool. Don't forget to take advantage of our buy 2 get 1 free option. Stock up on personalised calendars for unique Christmas gifts. We dispatch all personalised calendars A3 and A4 size, that are ordered by 8pm on the same day, meaning that with fast delivery you could have your calendar with you in just a few days. You can upload your own pictures or make a unique present for someone with pictures of them or their antics. Print photo calendars for friends and family right here and see before you buy with our online photo calendar preview. 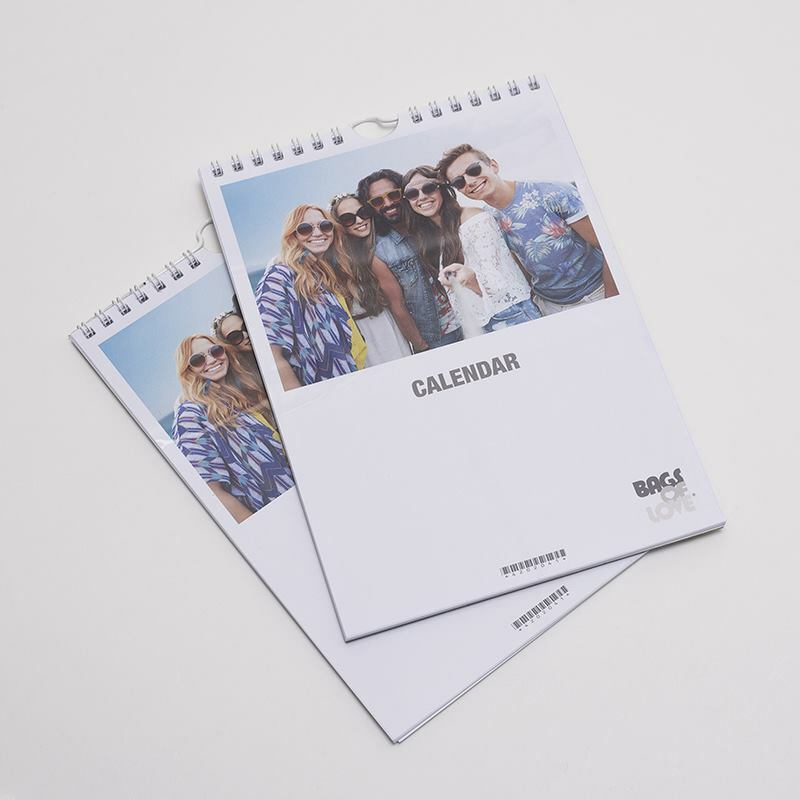 A4 and A3 calendar printing with your photos is a perfect present to send to friends and family abroad. Upload your digital photos for calendars in our online preview service and see your designs before your very eyes. Your photo wall calendars arrive ready to hang on the wall. Add digital photo wall calendars to your kitchen or hallway to display the best of your photos. All you have to do is upload your great photographs onto our photo calendar designer system and sit back and wait for the delivery. Custom wall calendars are easy to design and we make and send them fast. Your photos and text are printed onto high quality 160gsm art paper. This silky paper is perfect for calendar printing as it reproduces your images perfectly. Our specialist printing method produces crystal clear detailing, so even fine lines are depicted beautifully. Your photo calendar is bound with a handy spiral wire, which features a hanging hook. Design online with our calendar template. The traditional template gives you one month on each page, with the top half of the page left for you to design. The date boxes are large enough for small notes to be written on, and easy to read so you can keep track of the days with no problem. Cover - Design your calendar with the photo or photos of your choice on the cover, accompanied below with a caption of your choice (e.g. "2019 Windsor Family Calendar, with love from Charlie.."). You are able to customise the calendar cover as well as up to 12 pages - one for each month. Choose unique designs to represent each month, or simply fill the calendar with your favourite photos from the previous year. Caption - Personalised Cover Text - If you want some text, please type the words into the online calendar preview. Take care with spelling - we will print exactly as you provide. If you don't supply a caption, we will leave the area blank (this looks fine too). Ordering Online - Design a photo calendar online in our preview then, when ready, add to cart and make your payment. Try the online calendar preview to make a montage or collage on calendar pages, and you can see your edits and changes in real time before you order. Make it personal with calendars that encapsulate great times and happy days. Add your photos of friends or family or events and make a special personalised photo calendar starting from any month. These calendars will lighten up your interior and make you feel special. Ordering photo calendars online has never been easier. Just upload your favourite photographs and add caption text for each month and see your design online before your calendar gets printed! Luxury personalised 2019 diary with photo on both sides. Gorgeous printed satin bookcloth cover, corner pieces and coloured headband. Create your own personalised A6 calendar and create a fantastic New Year's gift. Comes in a pack of 4.